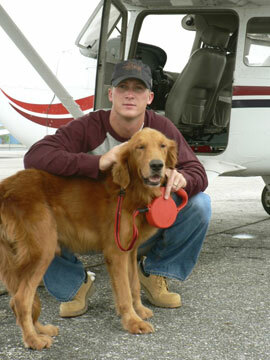 The unclaimed red Golden Retriever swam through Katrina and was picked up by Louisiana State University's Veterinarian Center. 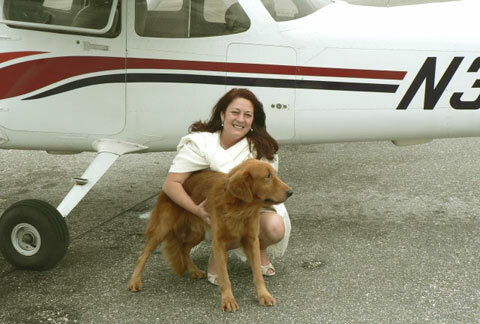 After being unclaimed for a long period of time, the dog was sent to Plantation, Florida and was adopted by Deborah R. Dolen in Sarasota, FL, owner of MabelWhite.com. 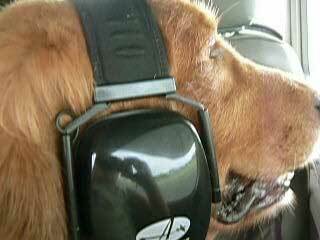 The head sets were because the plane was too loud for his ears, and so he could talk to air traffic control better! Before Deborah could retrieve Ringo, Hurricane Wilma hit South Florida leaving most of the Animal Rescues without electricity. Gas pumps could not work because they needed electric. A frantic cell phone call was made from the a Veterinarian to Deborah. Dolphin Aviation pitched in and a pilot named Dan Fleming volunteered to make a one hour flight to Ft. Lauderdale and pick up Ringo. Since the plane would be empty heading to the devastated area, Deborah quickly got a few hundred pounds of dog treats, coffee and creamer (the Veterinarians and staff mentioned they sure could use,) as well as tons of soap and candles for the Salvation Army. Deborah also donated children's activities to the Salvation Army such as coloring books and crayons. The companies who gave huge product to Deborah in minutes include Albertson's, Public, Winn Dixie, Petland (NOT PETSMART at all!,) and Starbucks. These companies who gave were very generous--not giving slack items. They boxed up GOOD STUFF! The flight went well and Deborah noticed the whole area of Ft. Lauderdale looked like corn fields that a tornado hit. They were not corn fields, they were huge forests of trees. Not to mention trailer parks and homes totally obliterated. What was not obliterated was tarped in blue, as they flew low most of the trip. Ringo is home safe in Sarasota, Fl, and continued efforts to still send supplies down to the Wilma area will not be forgotten. Deborah had lost her former Golden Retriever, Jasmine, because she heroically protected Deborah from a violent crime at 3:00 AM when she was sleeping. 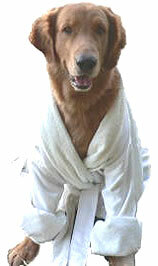 Bayshore Animal Hospital in Bradenton, FL is one of the best facilities for any kind of animals. Big birds too! Dr. Beamer and Dr. Mike Mossler that run the clinic are two of the best vets in the state. Although I will admit Dr. Mossler loves animals more than people. Pam, Rose and Carol do an awesome job negotiating the very busy, but kept well clean practice. They can be reached at (941) 756-5544. Want to know what Ringo is up to these days? Well, we'll let him tell you in his own words . . .
Ringo Star is my name and getting the most out of my Mom is my game. I am a hurricane dog twice over! Yeah Buddy. Now, a man of leisure I am the Editor in Chief of this division. Things are definitely going to change around here. For example, those green things? We are going to learn how to make them. My owner says they are, and I quote: "frigin expensive." (But I get them anyway.) And if she EVER puts that robe on me again I will chew it into a hundred billion pieces and show her what I am really capable of. Presently: Working on finding Mabel's cat since I landed, while my Mom writes totally el boro boro books all day.